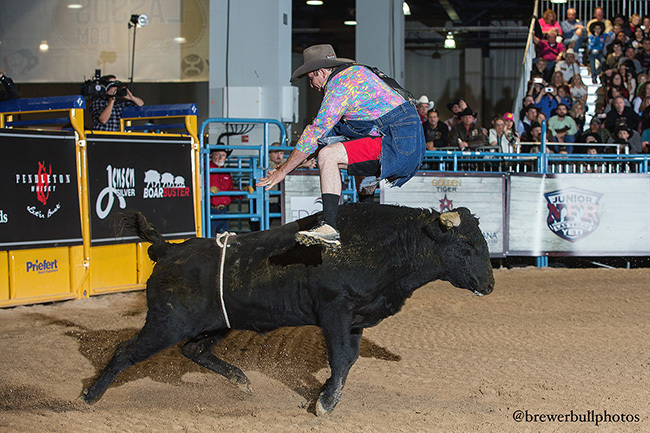 LAS VEGAS – Tate Rhoads and Kyle Lippincott knew they needed to do something special during Friday’s Bullfighters Only qualifier if they were to advance to next week’s BFO Las Vegas Championship. They did. Both men started their fights at the Las Vegas Convention Center with flat-footed jumps. It paid off as Rhoads won Round 1 with an 84-point fight with WAR Fighting Bulls Wicked Ways; Lippincott was 83.5 in his bout with WAR’s War Machine. Now they will move on to fight at the BFO Las Vegas Championship, which takes place Dec. 7-10 at the Hard Rock Hotel & Casino. Tickets are on sale now at HardRockHotel.com and AXS.com. It will feature a $50,000 purse and also include two more qualifiers that will advance through competition that takes place at 3:30 p.m. Saturday at the Las Vegas Convention Center. It was a similar type fight for Lippincott, who cleared his jump cleanly, then ran into a little trouble midway through the bout. Now he’ll be part of the first round of the tournament-style competition at the Hard Rock Hotel & Casino. “Last year I came in the qualifier round as well and made it to the last day before I got beat,” Lippincott said. “To be in the championship to be able to play with everybody else is everything. It takes high levels of self-worth to be successful in freestyle bullfighting, where men face athletic and aggressive animals that have been bred for this kind of competition. “It means the world to me to get this win,” Rhoads said. “My aunt and cousin were killed in a tragic car accident a couple weeks ago, and I wanted to come out here and do this for them. Part of it is just being part of the top freestyle bullfighting organization in the world. That includes next weekend’s purse of $50,000, which helps make the BFO Las Vegas Championship the richest bullfight in the sport’s history.